I work with a lot of Microsoft products, one of my favorite is Microsoft Deployment Toolkit and System Center Configuration Manager, otherwise known as MDT and SCCM (Sick-em boy). My favorite part is customizing the Windows Operating System. In my company, I work with the latest. Windows 10/SCCM 2012 R2 (1511)...yes there is a later one. What I enjoy is customizing Task Sequences. Writing PowerShell GUI's to control variables. Yes I know SCCM with MDT integrated and using its built in UDI wizard does all this for you, but what fun is that? Here is a PowerShell I wrote to prompt for a computer name. I have tested this against most of our Dell Systems and it does come back with the correct information. The cool thing is I loaded all the images as binary so it will load the proper image when prompted. Obviously as newer models come out; they too would need to be added. 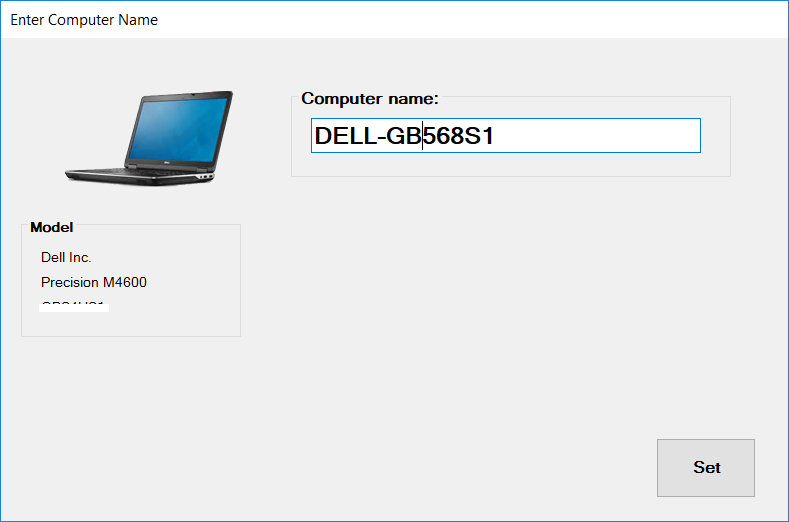 To get SCCM to prompt the computer name correctly, you will need a few prerequisites. To allow this script to be interactive, copy the ServiceUI.exe and TSProgressUI.exe from the MDT's <DeploymentShare>\tools\x64 folder (can also be found under the MDT installation folder in Templates). Add it as part of the script package. Wow very potential tool, would be nice if this can run stand alone. Script looks great. Is there a place that would show any errors? It ran the task but my machine still joined with a MIN-INT name.